Decorating your little girl’s room need not be a dreaded task. Monograms are a quick and creative way of decorating and making your little girl feel like a princess! At DecorativeLettering we have wall decals that are suitable for decorating your daughter’s room. 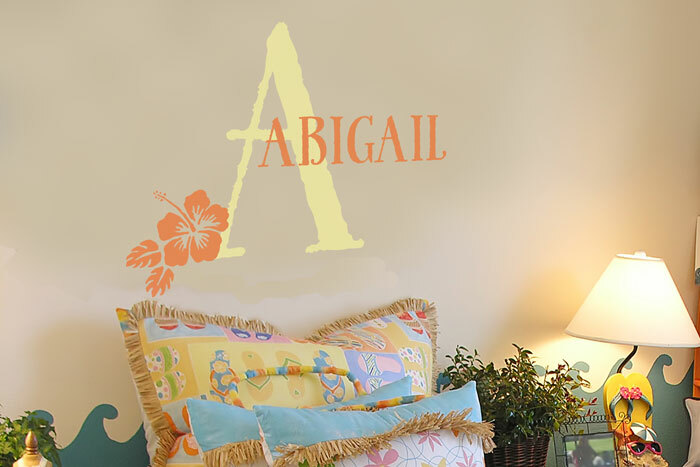 Our ‘Hibiscus Girls Name’ wall lettering on monograms are not only great to look at, but they will make her room a special place-just for her. They will look amazing on a number of wall spots : above her bed, next to a lamp shade, or play area. The choices are limitless: any empty wall space will do. The wall decals are the perfect accent. They are available in many colors. This means that they will tie in well with your decor. We have embellishments and lettering art that will jazz up your wall letters. These are ideal for setting the mood you want in this space. At DecorativeLettering we have many wall letters that you can choose from to decorate your little girl’s bedroom. You can also submit your preferred quote or saying. Use our pre viewer to make sure that you have selected the right wall lettering color, size and style. Our team of experienced designers will get to work and deliver quality products that you will enjoy for a long time. Do call or email: we would love to help you turn your daughter’s room into a haven: her name will be our inspiration!